Structures TV - Documentary on Downsview, Toronto from Ward Nine on Vimeo. Downsview derives it's name from John Perkins Bull, a Justice of the Peace who settled in this area around 1842. Bull named his farm "Downs View" as his property was situated on one of the highest elevations in Toronto. The Bull farmhouse included a courtroom addition and a jail which was located in the basement of the house. The John Perkins Bull house is still standing today at 450 Rustic Road where it is in use as a nursing home. 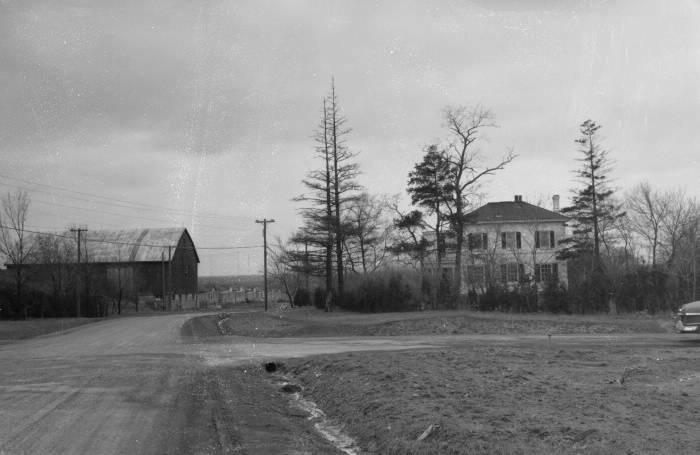 For over one hundred years Downsview was a thriving agricultural community with its own general store, school house and post office. The pillar of the community was the Downsview United Church. 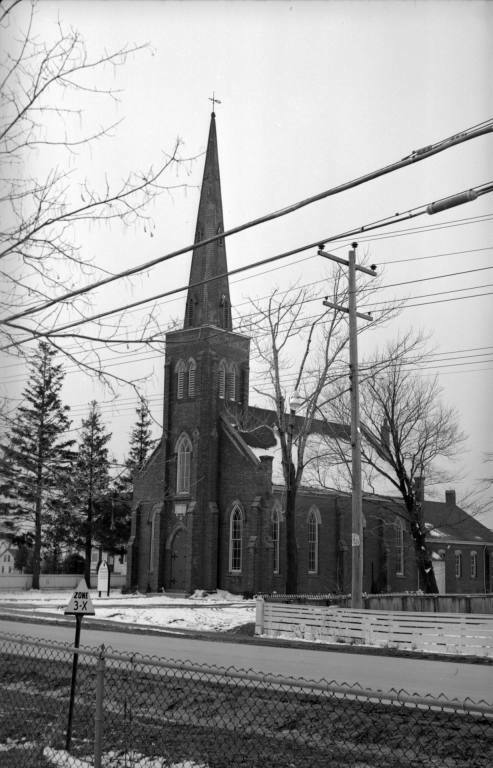 Built in 1870, this church is still standing in its original location at 2822 Keele Street. In 1824 John, Edward and a third brother from the Boake family sailed to Canada from Ireland and settled in York Township (Toronto) where their sister Elizabeth Bull was already settled. In 1830, the Boakes purchased a large parcel of land that today is Downsview Park. They built their homestead in 1856 and named it Locust Lodge because it was surrounded by hundreds of locust trees. Today this area in Downsview Park is known as Boake's Grove. Four generations of the Boake family made Locust Lodge their home until the land was expropriated by the military in 1951. Dufferin Street closed due to Mosquito crossing! 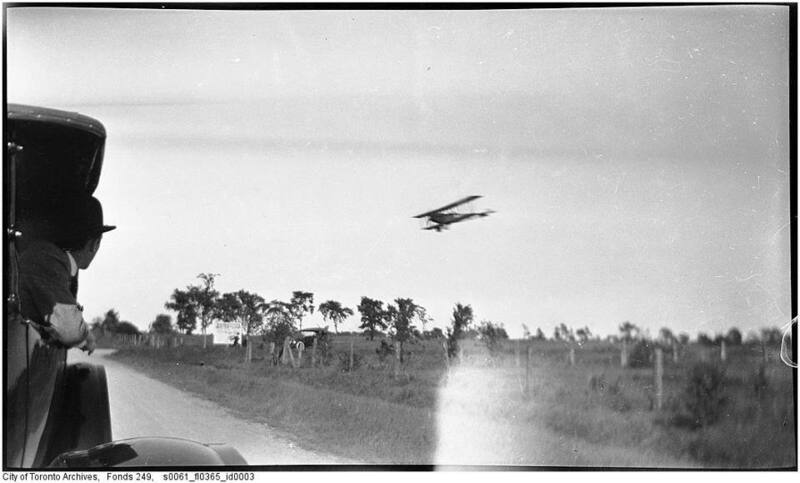 In April 1929, William De Havilland (cousin of actresses Olivia De Havilland and Joan Fontaine) purchased 70 acres of farmland along Sheppard Ave in order to build De Havilland Aircraft of Canada. They began with a staff of 35 in a 20, 000 sq. ft. plant next to the railway. The factory was Canada's largest supplier of military, civilian and government owned aircraft in the 1930s, providing the Ontario Provincial Air Service, and the Royal Canadian Air Force (RCAF) with the majority of their aircraft. Several record breaking flights were made with aircraft assembled or modified here in Downsview. Between 1936 and 1938, De Havilland purchased more land and added a hangar and a main building which is now known as the Downsview Park Sports Complex. When World War Two broke out, he acquired more land beside the plant to extend the existing runways and built additional facilities. Throughout the war they produced thousands of Mosquito fighter bombers and other planes. They continued to mark a number of firsts and significant accomplishments until the end of the war. In the mid 1950s, De Havilland moved its operations to a newly constructed facility to the southeast and was eventually purchased by Bombardier who still manufacture planes on the site today. 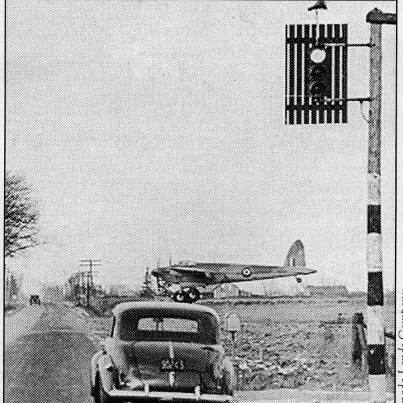 After the war, the Royal Canadian Air Force recognized the strategic importance and convenience of the Downsview Airport. In 1946, 400 Squadron RCAF were placed in Downsview. In 1949, 411 Squadron RCAF were also stationed here. Throughout the cold war these squadrons were responsible for the air defence of Toronto. Between 1947 and 1952 land was expropriated by the Department of National Defense under the War Measures Act to enable the RCAF to construct an air station and logistical support base at Downsview Airport. The RCAF constructed barracks as well as residences for their enlisted families. 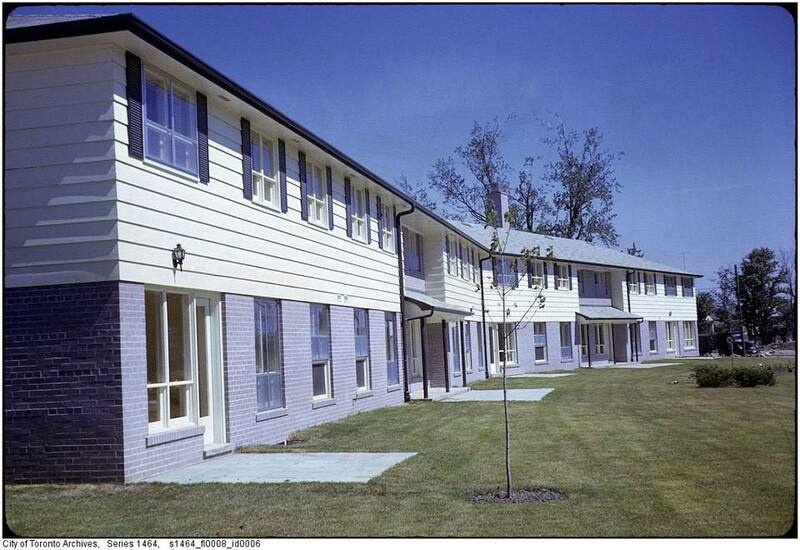 Military housing at Keele & Sheppard circa 1962. Photo courtesy of Vintage Toronto-Facebook. 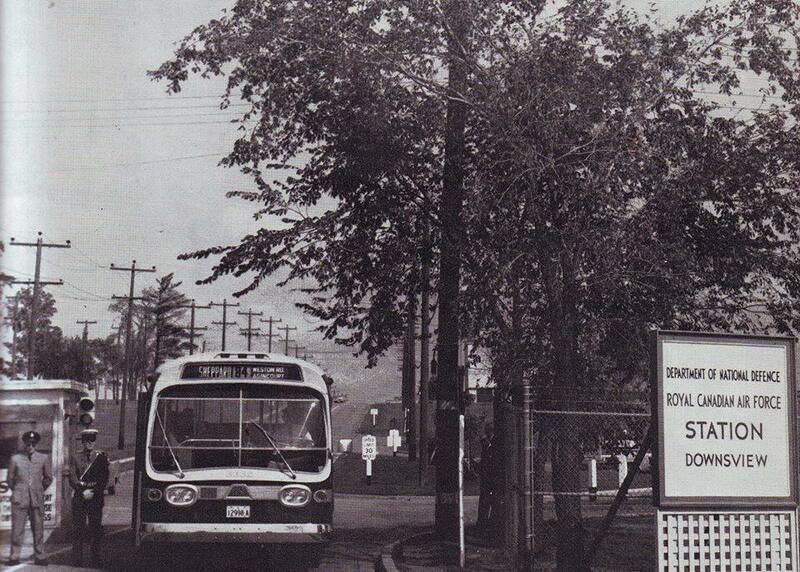 In 1954, in response to the Soviet threat and the Korean War, the RCAF built the supply depot, which today is where the Downsview Park Merchant's Market is held. The largest building in Downsview Park it was built as the central stores for the Canadian Forces in Canada and overseas. It distributed material to the Forces in Canada, Europe and those deployed elsewhere with the United Nations. The depot was built to be bomb proof (at the time) and to be able to withstand a non-nuclear ballistic missile attack. The building has no windows and the north and south loading doors are blast proof. Beneath the Supply Depot is a one million gallon (4, 547, 000 litres) stormwater reservoir which would have provided water in case of fire or attack. In 1995 the Federal Government announced the closure of CFB Downsview. Urban encroachment had made it impossible to land the ever larger aircraft that were being developed and the buildings and supply depot were becoming out of date. Once the war was over Downsview experienced a building boom which saw the entire neighbourhood developed by the early 1970's. Today Downsview is one of the largest and most diverse neighbourhoods in Toronto. Italian is the most common non-official language in Downsview-Roding-CFB. In the 2011 census, 14.6 PER CENT of residents listed Italian as their Mother Tongue, and 8.4 PER CENT listed Italian as their Home Language. * Between 2001 and 2011, the number of people in Downsview-Roding-CFB who listed Tagalog as their Home Language MORE THAN TRIPLED (295 people to 895). * While the number of people in the 0-14 age group has grown between 2006 to 2011, the group's overall population is still down 6.7% from its 2001 total. * The overall population in Downsview-Roding-CFB has increased by 1.3% between 2001 and 2011. * While Italian remains the top non-official Home Language in the neighbourhood the number of people in Downsview-Roding-CFB who listed Italian as their Home Language dropped by 21.9% between 2006 and 2011. * The number of people in Downsview-Roding-CFB who listed Portuguese as their Home Language increased by 51.8% between 2006 and 2011. Those who listed Tagalog increased by nearly as much (47.9%). In the 2011 census, the percentage of Seniors (those aged 65+) in Downsview-Roding-CFB who are living with family is 69%. That number is 63% in all of Toronto.